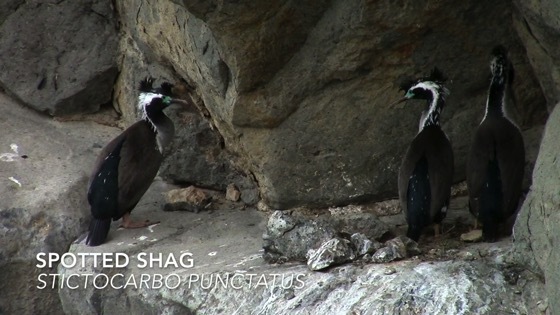 Spotted shags (Stictocarbo punctatus) roost on the cliff face of Taiaroa Head, Dunedin, New Zealand near the Royal Albatross Centre, the only mainland nesting site for the Royal Albatross — which also hosts tours each evening to their penguin observation platform to witness this daily event. The Royal Albatross Centre (host to the only mainland nesting site for the Royal Albatross) provides information and provides viewing of the nesting site. It also hosts tours each evening to their penguin observation platform to witness the evening arrival of the Little Blue Penguins to their burrows..